Betat Casino – Making Christmas great again! Week 2 of awesome at Betat! This year’s Christmas campaign has just completed a first successful week and you can embark now on the second of four amazing weeks of enticing offers as Santa campaigns to make Xmas great again! If you haven’t already, have a chat with Mrs. Claus who is raring to go with your double deposit match. There is also a fresh batch of Freedom Spins, this time offering you extra spins on the awesome games Jimi Hendrix and Victorious. For table players it will be a great 20% Cashback on net losses. Not to forget the Multiplier Races and ultimately the monthly Endurance Wager Reward. Not yet gaming at Betat? Then sign up now and claim their superb Welcome Package. Mrs. Claus: Ho Ho Ho – A match like no other! Betat’s unique bonus structure lets you play with your cash balance first. Should you hit that monster win before any bonus money is used, you can go straight to banking and withdraw it. Forfeit the bonus and the winnings are all yours. Wagering will start only once you dip into your bonus funds. Freedom Spins – Free Spins on some victorious titles! Welcome Returns – Keep winning whatever the outcome! The Wall – Choose your race! Get 1 point for every winning multiplier over x100 for bets that are between €0.30 and €0.99. 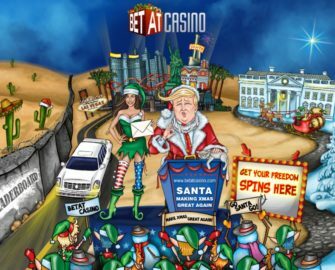 Santa’s Workshop – Making wagering great again! Operated by: NRR Entertainment Ltd. Customer support: Phone, Email, Live Chat (not 24/7).